Earn cash back rewards with no annual fee1. Credit Score  Fair: -- I've had a credit card, or loan for 1+ years. For the last 2+ years I've paid back debts to creditors (with no defaults). I haven't missed more than two payments on my credit in the last three months. Eligibility for rewards and/or account credit is subject to the terms and conditions of the Meridian Cash Back Rewards and Meridian Travel Rewards and US Dollar Cash Back Rewards programs. Please refer to respective terms and conditions brochures for full details. Insurance coverage is underwritten by Desjardins Financial Security Life Assurance Company. This document is provided for information purposes only. For details of the coverage, refer to the insurance contract or insurance certificate available online at meridianvisa.ca. Some conditions and restrictions apply. Insurance coverage is subject to change. Insurance coverage is underwritten by American Bankers Insurance Company of Florida (ABIC). ABIC, its subsidiaries and affiliates carry on business in Canada under the name of Assurant Solutions®. ®Assurant Solutions is a registered trademark of Assurant, Inc. Details of insurance coverage, including definitions, benefits, limitations and exclusions, are in the Certificate of Insurance. The Certificate of Insurance is available online at meridianvisa.ca. Insurance coverage is subject to change. When you use your card to purchase an eligible new item, and you find it for a lower written advertised price within 60 days from the date of purchase, you may be reimbursed for the difference up to $100 per item and $500 per account per year. 2. you have reported to Cardholder Service at 1.855.341.4643 (Canada and U.S.) or 1.515.343.8995 (International Collect) when you realize that your credit card was lost or stolen. If you believe there has been unauthorized use on your account you must call us and meet the conditions above, you are protected by Zero Liability. If you do not meet the conditions above, please reference your Cardholder Agreement for additional information regarding liability. 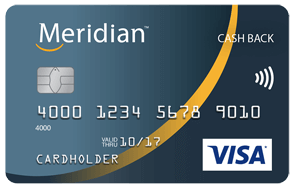 The Meridian™ Visa* Card is issued by Collabria Financial Services Inc. in a joint partnership with Meridian™ Credit Union pursuant to a license from Visa. *Trademarks of Visa Int., used under license. TMTrademarks of Meridian Credit Union Limited. With no annual fee, and only a relatively modest credit score needed to qualify, the Meridian™Visa* Cash Back Card allows you to start earning cash-back hassle-free. You can earn cash-back on gas, grocery and pharmacy purchases, and even on utility bill payments. The cash-back rate is a bit on the low side, but the Visa insurance coverage provides extra value. For added convenience, there is no cap on how much you can earn, and you can redeem your cash-back balance at any time. Simply put, if you want rewards without changing your daily shopping habits or spending any additional money on fees, this is the card for you. So, how does this card stack up to other cash-back cards? We crunched the numbers using our Best of Finance methodology to see how much you could earn over a 24-month period. Use this card for two years and you can earn enough cash to treat yourself to a nice gift, or cover groceries for a couple of weeks. Additional cards are free, so you and another cardholder can work towards earning even more cash-back. Earn 1% cash-back on gas, grocery and pharmacy store purchases and utility bill payments. Earn 0.5% cash-back on all other eligible purchases. There is no maximum cap on this cash-back program, and you can redeem your balance at any time. Extended insurance coverage, including purchase protection and extended warranty on your purchases3. Travel insurance coverage that includes travel accident and travel medical insurance2. Habitual phone-droppers rejoice! Mobile device insurance provides up to $1,000 if your smartphone or tablet is lost, stolen or damaged3. Global customer service support in case you have questions concerning charges to your account, fraud, or if your card is lost or stolen. Relatively low cash-back rate in comparison to other cards. No discount on balance transfers.